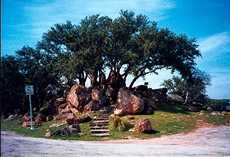 Marble Falls Texas, Marble Falls Hotels. The falls for which the town was named were called "great falls" or the "marble falls" as early as 1817. A man ahead of his time was Colonel Charles J. Todd. In 1851 he bought a good portion of the land along the river for $80. In 1854 "Todd's village" was to be a thriving community in a beautiful place, but few people saw Todd�s vision. The land went unsold for want of buyers and the county auctioned the land for taxes in 1880. Adam Johnson also saw the falls in 1854 and wanted to build an industrial showplace, channeling the waters of the Colorado into a riverside plant. Johnson enlisted in the Confederate army during the Civil War and was blinded for life, but not before becoming a General. In 1886 the now blind Johnson bought a good deal of land � including the all-important falls. The Texas Mining and Improvement Company was chartered in June 1887 and Johnson and nine investors put the first lots up for sale in July of 1887. 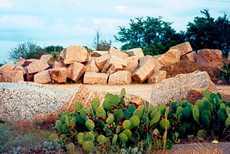 1885: Adam Johnson grants right-of-way across 7 miles of his property � letting a railroad spur be built from Burnet. The quarry donates the stone for free and the spur allows it to be hauled to Austin. 1890: the community had a weekly newspaper and an estimated 400 to 600 residents. 1920s: Paved roads and electric lights came in then 1920s. 1925: a dam was built to supply power to the Marble Falls Textile Mills Company � Johnson�s company. 1940: the population was just over 1,000. 1950s: A dam forms Lake Marble Falls, but destroys the natural falls. Granite Mountain � RM 1431 on the road to Burnet just North of town. From a roadside park (with the nicest picnic tables in the world) you can observe the quarrying of the same pink granite that was used in the construction of the state capitol building. The expression "he just dropped out of sight" had both figurative and literal meaning in Burnet County during and after the Civil War. Common belief held that folks who disappeared in that area often ended up at the bottom of a 150-plus-deep foot limestone fissure south of Marble Falls aptly named "Dead Man's Hole." 1 block SE of the US Hwy 281/FM 1431 intersection.